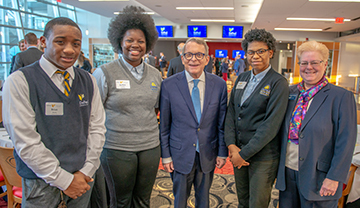 “I love the Cristo Rey model; this is a model that works.” With these words Ohio Governor Mike DeWine opened his keynote address at DePaul Cristo Rey’s Corporate Partner Leadership Breakfast. Governor DeWine, formerly the Ohio Attorney General, is very familiar with DePaul Cristo Rey and the Columbus and Cleveland Cristo Rey schools. The Attorney General’s Office participates in the CWSP with students working in their offices in all three cities.